The Enterprise: Art at the Farm - an inspirational studio for developing artists. Highlights: A thriving art enterprise set in an idyllic Oast house in beautiful Kentish countryside. 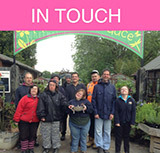 A hub of creativity, open throughout the year and attended by adults with learning difficulties. The artists who attend create textiles, paintings and ceramics for sale. The studio is a happy dynamic space for the creation of unique, one off pieces. Increasingly the work is being recognised for its quality. We offer accredited City and Guilds training in pottery and a personalised range of 1-1 sessions for those with more complex needs enabling them to experience a wide variety of sensory art forms. We were selected to exhibit at the Turner Contemporary in Margate December 2013, alongside professional artists and small business in Kent. We were also thrilled to be commissioned to make a ceramic Tea Set for Sir David Nicholson, Chief Executive of the NHS, for his retirement party. Our work was spotted and admired in our Coterie Tea Rooms, and on the 10th of March, artist Neil Calvery travelled to St. Thomas’ to personally deliver this gift. Look out for: Our studio’s products, all of which are handmade and unique, including cards for every occasion, beautiful handmade cushions, colourful aprons, canvas bags, pottery and bespoke bunting. The studio undertakes community arts products and exhibitions and supports artists with learning difficulties in developing their skills. Each artist can develop their own portfolio and many of the artists’ work are shown at local exhibitions and sold through our outlets. The Benefits: The studio is able to support the creative expression of a range of artists with varying needs. Individuals are encouraged to grow in confidence. Learning working skills through art as a means of communication and expression through art. Support our COT arts project, and treat yourself to something beautiful and unique. Our products make wonderful gifts too. Check out our online shop and know that you are supporting a great cause as you click "buy". please call 01233 860 093 or have a look at our online shop.